Thoughts on getting our horses enthused about our ideas. At the end of the day my main goal is to communicate effectively with horses as well as I do with people. This doesn’t always work out how I’d like, but it’s an ever changing process that gets a little better with each horse. It all starts from when we catch our horses-if it’s a colt we have to prepare them to be caught. Are we paying attention to whether or not their feet are in a position to be caught. Does the horse look like he’s preparing to help be caught or is he trying to get away. 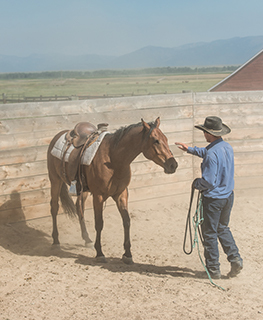 Everything we do with the horse, like roping a cow or doing a turnaround, it all starts by getting the horse prepared to do it. If we prepare our horses and make it easy for him to do what we like they will most certainly take us up on it. We don’t just start out with sliding stops and flying changes, we build the horses’ education through many different exercises and experiences, all the while rewarding the horse, making things as peaceful as we can as soon as they THINK about heading in the right direction. I know something that I personally battle with daily is giving the horses a break when they think of the idea. This is so important. If we are timely enough when we reward the idea, you will be amazed at how quickly the action will follow, and it won’t just come half way with them dragging around and you begging them. If we reward the thoughts, then the horses will come through with enthusiasm and energy and try and help us out with what we are after, and at the end of the day that’s really all I’m after.